As we were driving down a few country roads this week we noticed a common theme —boxes, tables, and bags of “Free Produce” resting on the side of the road. We even saw one sign that begged the passerby to “PLEASE take some zucchini”. 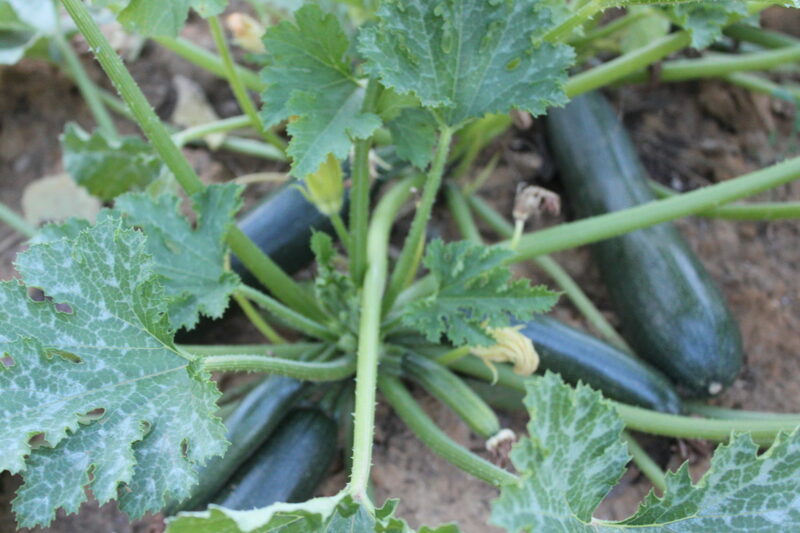 Just like our neighbors, we are fortunate enough to have a plentiful crop of zucchini in our garden this year. We have sauteed, steamed, and roasted it in almost every lunch and dinner dish this week. Jim isn’t a big fan of this vegetable – so of course, I have to camouflage it with the other ingredients. He eats it, and doesn’t even know it! 🙂 However, one thing that he (and the rest of our family and friends) is more than happy to eat is Zucchini Bread. 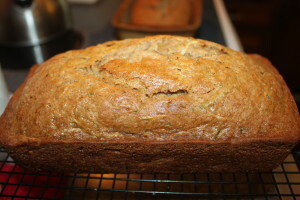 The secret to making zucchini bread irresistible is to make sure that it is moist. There is nothing worse than taking your first bite and have it crumble right into your hand. I have tried several recipes to make this bread moist and delicious – I have used juice, applesauce, and various oils and shortenings. The best recipe is this classic one that provides the perfect amount of moisture, which make this the ‘go-to’ zucchini bread recipe in our house. Feel free to make a few extra loaves to freeze later – or you can even freeze the extra zucchini that you have (or picked up from a neighbor or the side of the road) to make this recipe later in the year. 1. In a large bowl combine, flour, salt, baking soda, baking powder, cinnamon, ginger. Whisk until combined and set aside. 2. In a mixing bowl (using a paddle attachment if applicable), combine white sugar and oil – mix until creamy. 3. Add brown sugar, eggs, & vanilla. Mix until combined. 4. Slowly add the dry mixture into the wet mixture and mix until combined. * Mixture will be thick. 5. Grate the zucchini and fold it into the batter. * The liquid in the zucchini will make the batter thinner. Zucchini bread cooling after being removed from the oven. 6. Pour half of the batter into a greased and floured loaf pan. Repeat to fill the other loaf pan. 7. Bake for 45-60 minutes. It is a done when you insert a toothpick and it comes out clean. In a large bowl combine, flour, salt, baking soda, baking powder, cinnamon, ginger. Whisk until combined and set aside. In a mixing bowl (using a paddle attachment if applicable), combine white sugar and oil – mix until creamy. Add brown sugar, eggs, & vanilla. Mix until combined. Slowly add the dry mixture into the wet mixture and mix until combined. * Mixture will be thick. Grate the zucchini and fold it into the batter. * The liquid in the zucchini will make the batter thinner. Pour half of the batter into a greased and floured loaf pan. Repeat to fill the other loaf pan. Bake for 45-60 minutes. It is a done when you insert a toothpick and it comes out clean.